Everyone likes Mexican right?? Okay, maybe not everyone but most people seem to and I am especially a fan! What I like most about this recipe is that you get the delicious authentic Mexican flavors of enchiladas but with less assembly required. I chose to use black beans as the protein source here because they are healthy and do not need any extra prep ahead of assembly. You could of course use any type of bean or meat if you like, as well as adjusting the seasoning to your degree of preferred spice. 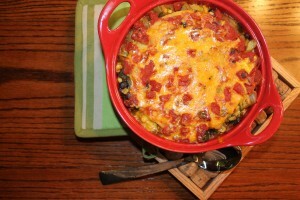 The heat here mainly comes from the Poblano peppers which add a nice smokiness and depth to the sauteed vegetable mix. If you are not a fan of spiciness than swap them out for bell peppers or if you want to kick it up a bit add some fresh diced jalapeno to the saute. The beauty of cooking is that there is no right or wrong way to execute dishes like these so have fun with it! A layered enchilada bake of poblanos, tomatillos, corn, fire-roasted tomatoes and black beans with corn tortillas and cheddar cheese. Heat Olive Oil in large saute pan over medium heat. Saute onions for 4-5 minutes or until they are translucent. Add the tomatillos and garlic and continue to saute for 3-4 minutes until the tomatillos begin to soften and release their juices. Continue with the vegetable mixture by adding the corn and spices in next. Allow mixture to simmer for 2-3 minutes more. Add black beans in and set aside. To assemble you will need a casserole or baking dish, I usually use a round one to fit the tortillas best but any will do. Start by putting a few spoonfuls of the diced tomatoes on the bottom of the dish. Layer 1-2 tortillas on to cover the area, you may need to cut them to get the best fit. Spread a third of the vegetable and bean mixture on top of the tortillas and then sprinkle with cheese. Continue with the tomatoes next and build two more layers. Spoon the remaining tomatoes on top and cover with remaining cheese. Cover with aluminum foil and bake for 30 minutes. Allow to sit 10 minutes before serving.